A banking rewards program done right. We were approached by a banking company’s innovation team in May. They were in talks for creating a data-transparent, consumer-empowering rewards program with multiple companies. Our challenge was to create a user-friendly prototype that they could show to many different stakeholders so they could seal the deal. They asked us to take their user research and business goals, and create a prototype in 4 weeks. My challenge was to create a User Journey and microframes for a modular prototype. We started with the main stages of the app. 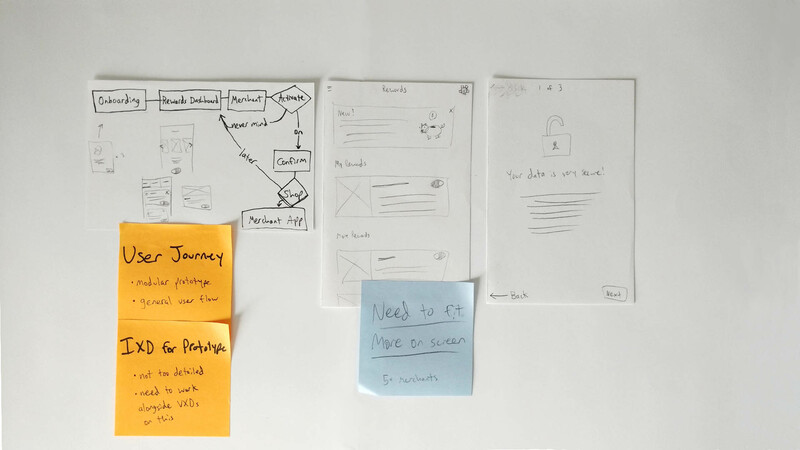 First-time users start with a 1-2-3 Onboarding process. 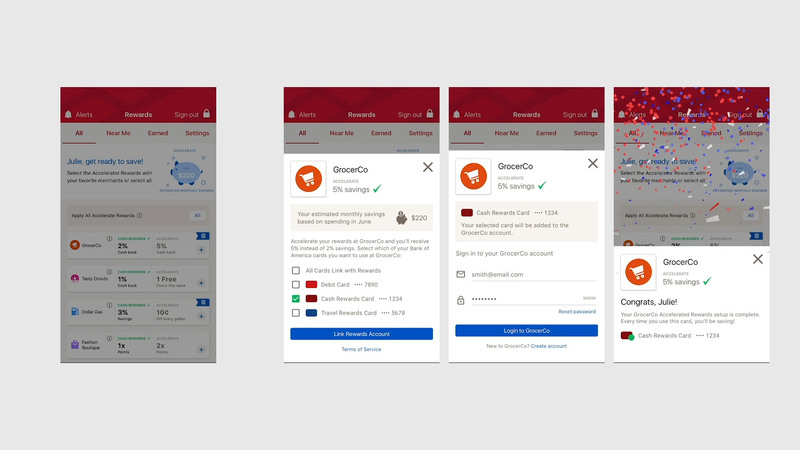 After that, users start on the Rewards Dashboard; to get rewards they select a reward with any of their favorite merchants, then verify their sign up. 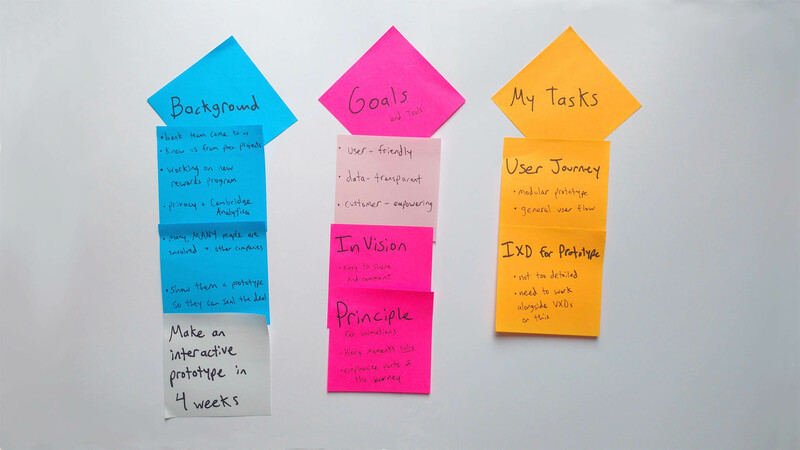 Our client's user research was limited, and they urged us to create a User Journey that could work for anybody. This meant that one of our goals was to reduce as many unnecessary steps as possible and create a toned-down feedback loop so people will enjoy using the app. The initial journey was quite long, so we met with our clients to see how we could refine certain stages. We agreed on in-app sign-in’s, a Toggle All feature, and an expedited onboarding process. 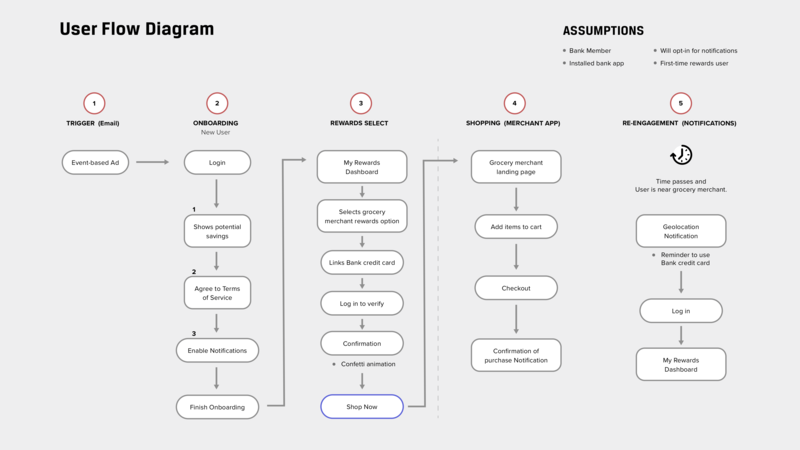 By simplifying these stages, we were able to expand the journey for different kinds of users. 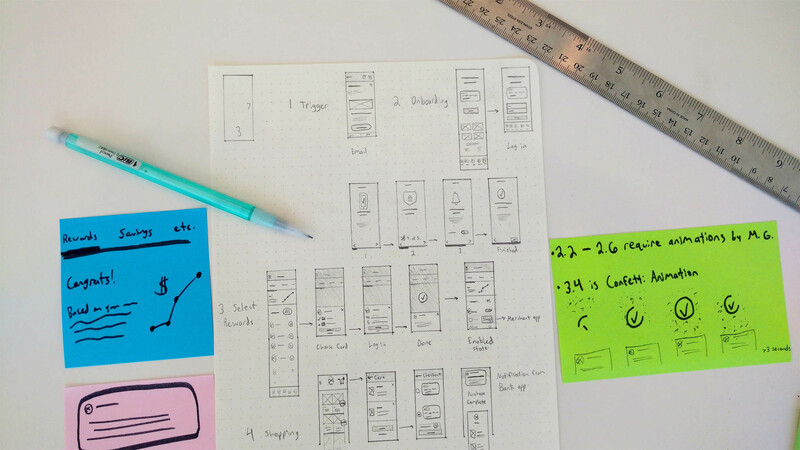 I created microframes (or small lo-fi wireframes) for our Visual Experience Designers, Konstantine Pangalos and Meghan Porter, so they could work on the app’s UI while I was still finalizing the User Journey with our clients. 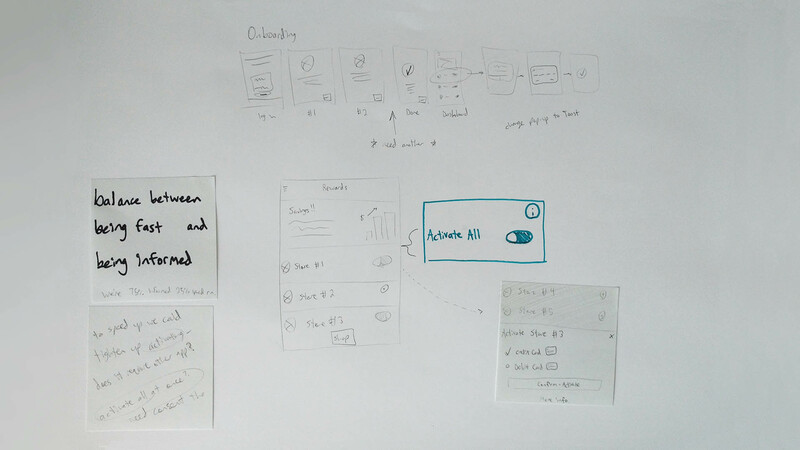 We only had 4 weeks to create the prototype, so larger and higher-fidelity wireframes weren’t entirely necessary. After the microframes were done, our VXDs asked me to dust off my animation skills and create a Praise animation for each sign-up. The client asked for a confetti animation, we agreed, and I was grateful to work with particles in After Effects again. Our project was extended to last another month, but they no longer needed any IXD updates so I left to work on other projects. The clients loved our prototype and our companies started a fruitful relationship together.